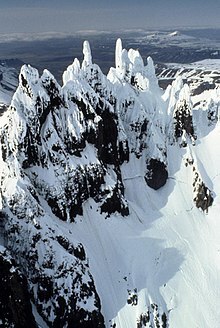 Aghileen Pinnacles Mountains in Izembek National Wildlife Refuge. Aleutians East Borough (/əˈljuːʃənz/) is a 2nd class borough in the U.S. state of Alaska. As of the 2010 census the borough's population was 3,141. The borough seat is Sand Point. According to archaeological evidence, the area has been inhabited by the Unanga since the last ice age. Early contact was with Russian fur traders who sought sea otters in these islands. Whaling, fishing and cannery operations brought an influx of Scandinavian and European fishermen in the early 1900s. During World War II, the area was a strategic military site for the Aleutian Campaign, and many locals were evacuated to Ketchikan. According to the U.S. Census Bureau, the borough has a total area of 15,010 square miles (38,900 km2), of which 6,982 square miles (18,080 km2) is land and 8,028 square miles (20,790 km2) (53.5%) is water. Aleutians East Borough is located at 57° north latitude and 162° west longitude. It comprises the westernmost portion of the Alaska Peninsula, and a small number of the Aleutian Islands, from which the borough name derives. Also included are the Shumagin Islands, as well as the Pavlof Islands and the Sanak Islands. In all, about 63.9 percent of its land area comprises land on the Alaska Peninsula, while 36.1 percent is on the numerous islands. There are five incorporated cities and two unincorporated villages within the borough. Temperatures range from -9 to 76 degrees Fahrenheit. Annual precipitation is 33 inches and annual snowfall is 52 inches. As of the census of 2000, there were 2,697 people, 526 households, and 344 families residing in the borough. The population density was 0.386 people per square mile (0.149/km²). There were 724 housing units at an average density of 0 per square mile (0/km²). The racial makeup of the borough was 23.95% White, 1.67% Black or African American, 37.26% Native American, 26.51% Asian, 0.30% Pacific Islander, 7.38% from other races, and 2.93% from two or more races. 12.57% of the population were Hispanic or Latino of any race. 22.25% reported speaking Tagalog at home, while 13.03% speak Spanish, 2.00% speak Ilokano, and 1.20% Aleut . There were 526 households out of which 39.20% had children under the age of 18 living with them, 44.10% were married couples living together, 14.40% had a female householder with no husband present, and 34.60% were non-families. 27.40% of all households were made up of individuals and 3.40% had someone living alone who was 65 years of age or older. The average household size was 2.69 and the average family size was 3.30. In the borough the population was spread out with 16.80% under the age of 18, 10.20% from 18 to 24, 42.30% from 25 to 44, 28.10% from 45 to 64, and 2.60% who were 65 years of age or older. The median age was 37 years. For every 100 females, there were 184.80 males. For every 100 females age 18 and over, there were 207.70 males. A 2014 analysis by The Atlantic found Aleutians East Borough to be the 2nd most racially diverse county-equivalent in the United States, behind the Aleutians West Census Area. This information is available on a community basis. Communities located within the borough include: Akutan, Belkofski, Cold Bay, False Pass, King Cove, Nelson Lagoon, Pauloff Harbor, Sand Point, and Unga. There are 7 schools located in the borough, attended by 273 students. 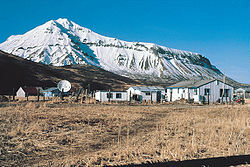 The Sand Point Clinic is managed by Eastern Aleutian Tribes, Inc. and inhabited a new facility in 2006. The clinic is staffed by low-level professionals and Community Health Aide/Practitioners or CHAs. The CHA role is unique to Alaska and Native Health Care. The borough's economy is cash-based. Commercial fishing and fish processing dominate and occur almost year-round. 222 borough residents hold commercial fishing permits. Sand Point is home to the largest fishing fleet in the Aleutian Chain. Salmon and pacific cod processing occur at Peter Pan Seafoods (Port Moller and King Cove), Trident Seafoods (Sand Point and Akutan), and Bering Pacific (False Pass). The Peter Pan cannery in King Cove is one of the largest operations under one roof in Alaska. Transportation and other services provide year-round employment. Several airports are accessible in the Borough, and float planes can land in many communities. Marine cargo vessels also provide transportation. The State Ferry operates during the summer. Local transportation is primarily by fishing boats or skiffs, since there are no roads. ^ "Substantial Changes to Counties and County Equivalent Entities: 1970–Present". United States Census Bureau, Geography Division. 24 May 2002. Archived from the original on 6 May 2009. Retrieved 3 May 2012. ^ 1996 Alaska Municipal Officials Directory. Juneau: Alaska Municipal League/Alaska Department of Community and Regional Affairs. January 1996. p. 1. ^ "Aleutian". Oxford Dictionaries. Oxford University Press. Retrieved 2016-01-22. ^ "Aleutian". Dictionary.com Unabridged. Random House. Retrieved 2016-01-22. ^ a b "State & County QuickFacts". United States Census Bureau. Archived from the original on July 6, 2011. Retrieved May 17, 2014. ^ "U.S. Decennial Census". United States Census Bureau. Archived from the original on May 12, 2015. Retrieved May 17, 2014.